Of the many cats I’ve known over the years, I’ve lost four. Two never returned. I know the heartbreak of looking for and missing a beloved cat. My cat Coco (Merlin’s sister) went missing many years ago in Toronto. I canvassed the neighborhood, put up posters and felt her presence nearby. I kept looking and calling but she was stuck up a tree, so high up I couldn’t see her and she refused to make a sound. Finally, after being in stranded up a tree for two days and two nights, someone called me from the flyer who said he’d seen her. A neighbor found the longest ladder I’d ever seen and since the fire department didn’t rescue cats, I put my fear of heights on hold and climbed up. With one hand on the ladder, I dangled Coco by the scruff of her neck from my outstretched arm to avoid being shredded and climbed down. A small crowd had gathered and cheered. Coco was rescued safely. Cats seem to have a sort of homing instinct which in some cases have guided cats to travel hundreds of miles back to their home. Most indoor-only cats tend not to travel far. While an adventurous indoor/outdoor cat is more likely to roam, a scared cat may not trust their inner compass, get confused and get lost. Once a cat has wandered out of their comfort zone anything can happen to scare them further: Barking dogs, wildlife, loud traffic noise, teasing school kids, the list is endless. When I moved to my last home in Canada in 1999, my cat Merlin escaped from the open back door into the woods as soon as the movers left. Exhausted after a long day, I had no choice but to go looking for him. I pounded the street, knocking on every neighbors’ door and introduced myself. Before long I had an entire posse of neighbors looking for him. Merlin returned on his own at bedtime, nonplussed as ever. “See mom, I wanted you to meet the neighbors and make new friends.” He never got lost again. Not all cats are that lucky. 2) Don’t waste time. If you know your cat is missing, grab your cellphone with a photo of your cat uploaded, flashlight and treats and head out. Wear comfortable clothes and comfortable soft-soled shoes. Don’t panic. Breathe, try to be calm and think like a cat. If you were a cat where would you go? Begin around your house and spread out to the immediate neighbors on all sides. Where does your cat normally head? What is the most likely escape route? What are their favorite bushes or hiding spots? Crouch low under porches, scan high on roof lines and tree branches. Could something have recently happened to spook them? Construction or a new neighbor’s cat or dog? Or has anything happened recently in your home to upset them; like the chemicals from getting your carpets cleaned or bringing out suitcases for a trip? 3) While you’re searching, ask pedestrians, knock on neighbor’s doors and show the photo. Ask if you can check their garage, sheds, under the porch. I must admit I did, in my desperation trespass in neighbors’ gardens. This is no time to be shy. 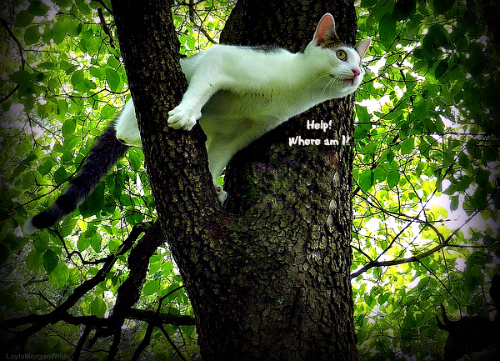 To save time, multi-task during the search: leave a missing cat report with your vet, Animal Control, all the other local vets, shelters and rescue groups. 4) When you return home, leave food and water outside your door. Fearful cats will often slink out after dark. Leaving a baby monitor near the food may detect faint meows. Local TNR rescue rescues will often lend a trap. Using their suggestions, set up a trap. Be prepared, you may trap a raccoon or other cat. Go outside one last time to check and call your cat’s name before bedtime. Try to get some rest. Leaving no stone unturned to find your cat takes energy. In the quiet darkness, try to communicate with your cat. Imagine their face, call their name and connect heart to heart. Try to tune into where they might be. It may be a feeling, an image or sound. Reassure them that you will help get them home. 5) If you haven’t already made a missing cat poster, make one. It doesn’t have to be fancy but make sure the words “Lost Cat” are large enough to be visible from a passing vehicle or pedestrian. Luckily most of us have a gazillion photos of our cats of. Choose or crop a large close-up showing details of the face and another photo showing the entire body, ideally standing up. If you’re not computer savvy, you can glue a photo on a piece of paper and use a marker to write the text by hand. Color photos are preferable especially if your cat has a unique color or markings. Copies printed on neon bright paper show well and use plastic page covers in case of rain. Include: your cat’s name, description, any special identifying marks or collar, when last seen and where (cross street), your phone and e-mail but for security reasons not your name, address or amount of reward in case you are offering one. I also like adding contact info at the bottom of the page cut into four or five vertical strips that can be easily torn off. 6) Enlist family and friends to help post flyers and spread the word. Have push pins, tape and a staple gun depending on the surface. The best posting spots include street intersection poles, local bulletin boards at grocery stores, library, laundromat and community center. 7) Post missing cats reports at online at Tabbytracker Craigslist, local online newspapers like Patch etc. Use social networking like Facebook and Twitter. Ask everyone to share. 8) Visit all your local shelters even if say they don’t have a cat of your description. 9) If you’ve recently moved, extend your search to your old neighborhood. 10) Persevere! Cats have returned weeks and months later. Keep networking, and asking neighbors if they’ve noticed anything. Keep your flyers or posters fresh with a “Still Missing” header. I hope you never lose a cat, but just in case, be prepared and make a copy of this list.